The best little Op Shop in the North East, the Violet Town Op Shop in its new location on Cowslip St is especially popular on Market Day with many specials. Come and check our ever-changing extensive range of clothing, books, crockery, cutlery and other household items. 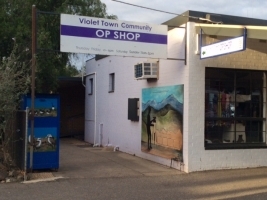 The Violet Town Community Op Shop is an important community service that benefits a wide range of individuals. It provides the pleasure of giving to those donating goods, gives volunteers a sense of purpose and acknowledgment in making a difference and is a link to the Violet Town community of people as it converts the donated goods into funds to support local community groups and organisations. Entry on Market Day is also available via the rear gate.